Surabhi @ My Cook Book has posted the round up of last month's EP series- Mint & coriander seeds.Do drop by her space & collect your token of appreciation for the wonderful participation.Coming back to today's recipe is the Chicken Puffs,well versed with everyone and an easy way to use up your puff pastry sheets but a very tasty filling which none can stop eating by one puff :-)This is another recipe which my family loves and never makes it to the table for photos and vanishes before that..Somehow managed this time to get some clicks,hope you will all enjoy making this at home and relish with a cup of hot tea!! -Cook the chicken with little pepper and salt for 7-10 minutes.Drain the stock or reserve for soups.Mince the cooked chicken in a food processor or blender. -Prepare the filling by heating a pan with oil.Saute the sliced onion till lightly browned and the oil seeps out and then add ginger garlic paste,saute till raw smell disppears. -Add the spices and mix on low flame.Add the chopped tomatoes,curry leaves,chopped coriander leaves. -Add 1/3 cup of water and let it cook for sometime.Add the cooked chicken when the gravy thickens and then keep stirring till the water content dries up.Add in the chat masala & lemon juice now and put off flame. -Apply or brush egg white on top of each of them. -Place it in the oven and bake for 15 minutes. -Remove from oven & cool on wire rack for 5 minutes before serving. * You can make the filling with paneer or soya chunks if you are a vegetarian the same way. *Applying egg white gives a nice color after baking.You can also apply butter instead of egg. 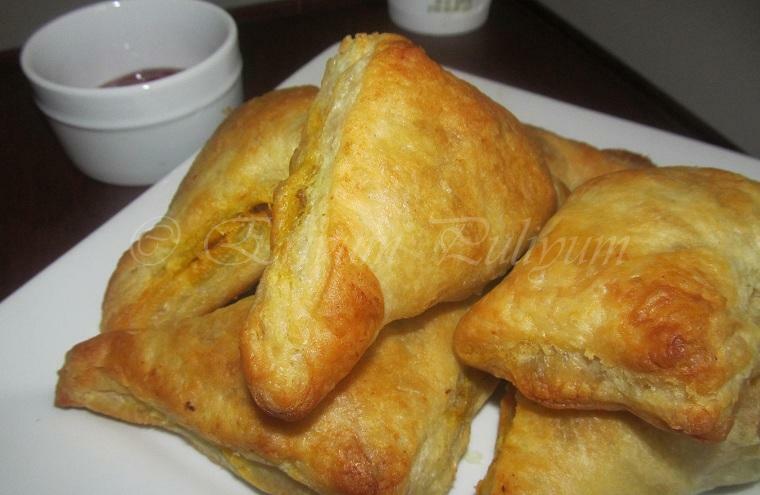 Puffs look super delicious dear. Nice clicks too. mouth watering puffs..great golden color..pass me a few Jules! 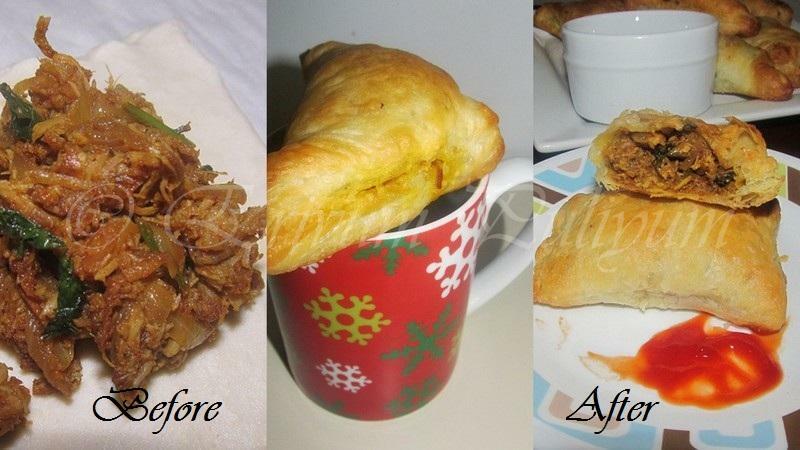 I love puff pastry. It is so versatile. Your chicken puffs look delicious. I love a few with black coffee. Am drooling over that super tempting chicken puffs. 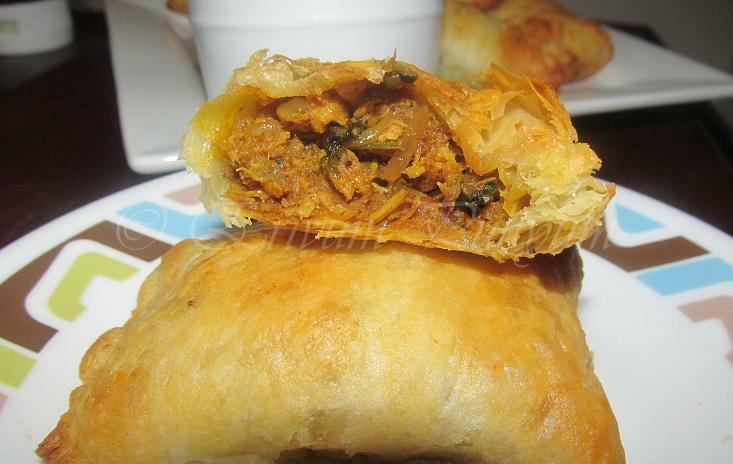 Amazing and a must try; it reminds me of empanadas but with puff pastry. Well done n well presented!! This looks very delicious & tempting, I'm feeling so hungry!